Teacher Appreciation Week is the first full week in May. 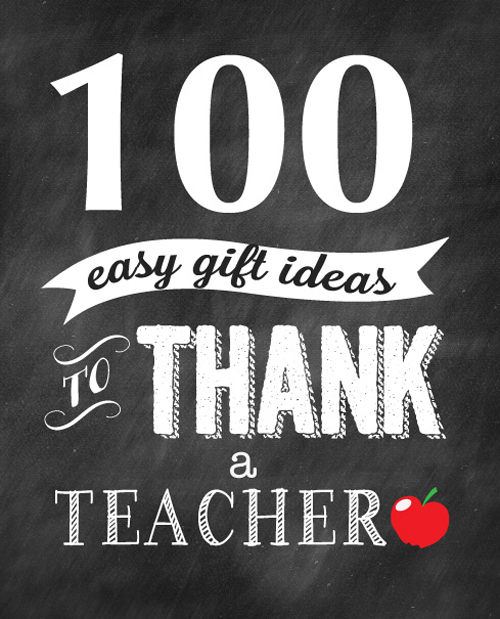 Here are 100 easy ways to thank a teacher. Most of these ideas come with a free printable. All you need to do is purchase the gift and print the tag and you have a clever and thought gift for your teacher. I think you will love these cute sayings! Treat your teacher to a special lunch in this DIY oil cloth lunch sack. Give a basket of apples with printable paper leaf messages stuck in each apple. This bookplates can even be customized for your teacher! Thank you for helping my child bloom. Make these printable custom flower picks and stick in a flowering plant. Have your child make this simple photo holder and then place the printable saying in the holder. Attach this printable gift tag with saying to a beautiful mum. Thanks a latte for all you do gift card holder. Place a coffee shop gift card in this free printable gift card holder. Don’t forget to write ‘Just a note to say thank you for all you do‘ on the top sheet for a useful gift! These flowers are a bright and cheery way to say thank you! Add a cute tag that says thanks for helping my child bloom. Create a memorable keepsake for your teacher with this DIY photo album tutorial all made from a dollar store photo album. Thank you for helping me grow up great! Turn this printable saying into a darling paper medallion and give along with flowers. “In my book you’re top the charts”! Print this free tag and give a book for the class library! “It’s been a sweet year”! Wrap this tag around a sweet treat for the sweetest teacher around! Send a delicious gourmet caramel apple with this tag attached! Wrap up some swedish fish, attach the tag for this fantastic treat! You are all that and a bag of chips! We Appreciation all you Dew! All you need is the free download, a bag of chips and a bottle of pop. Thanks for a great year! I hope my child didn’t drive you nuts! Add adorable NUTS printable to the handle, fill with peanuts and you’ve got yourself a great gift! Thank you for being an M&M Marvelous and Magnificent Teacher. If you have a teacher that loves M&M’s this gift idea is perfect for them! Print off this cute teacher themed gift tag and attach to a bouquet of flowers. This custom chalkboard notebook makes a clever and useful teacher gift. You are the best teacher bar none! These printable candy bar wrappers make for an easy gift. Fill a clear pitcher with a pile of fresh lemons. Then, tie a pretty bow around the whole pitcher attach a cute little envelope with a note and gift card for a housewares store. Create this movie themed gift with this free printable! Life is adventure! Summer Survival kit! A Summer Survival Kit for their summer adventures is perfect! Great for camping, a day hike, or taking along on a bike ride. Follow this tutorial to make this beautiful and thrifty project to create for a special teacher in your life. Say Thank you with a cute custom clip board! Easy up cycled gift card holder this little gift card holder is perfect for any gift giving occasion and a great way to reuse something that is normally discarded. “Teachers – feed young minds, make little hearts feel full, and create a hunger for learning” Gift Card PrintableAttach a gift card directly to the striped area of the printable or you can get a little creative. Use this fun and FREE teacher appreciation printable that’s perfect for a SODA loving teacher. Linked Key chain with Charm diy gift idea! Learn how to make a fun and unique way for teachers to carry their school pride with them from place to place. You’re the best ‘sub’ ever! Attach this idea to a subway gift card for the favorite sub or helper in your classroom! We love teachers stationary gift idea! Print out this lovely stationary and include a heart felt thank you note! Teachers love to hear from you. This little red apple gift card holder is just the ticket (to the movies)! Did you look on Pinterest for a clever teacher gift idea? Play of your non crafty side with these funny printable gift card holders! With three designs you can pick your favorite saying, or give them to different teachers. Some delicious homemade cookies plus this cute printable gift card! Thanks a ‘bundt’ch Teacher gift idea! Show your appreciation with something sweet! Mini Bundt cake + a cute tag = a happy teacher. Pick a favorite thing wrap it up and print this out! Now you have the perfect way to let someone know how special they are! Grab a potted mum and print out this tag! I have to ad ‘mit you’re a great teacher! All you need is an oven mitt and some treats (candy, pencils, pens etc. ), some ribbon and the free printable. You are too nice to be forgotten! Personalize calculators with a fun “equation” printable gift tag to package them in a special way. Make this teacher appreciation organizer…a cute classy organizer that would be fun and functional to have on a desk. This tutorial will help you make personalized aprons for your teacher gifts! Thanks for sparking my creative juices this year! All you need is a resuseable cup can a juice gift card and this free printable! Message in a bottle teacher gift idea! Put a heartfelt note inside a bottle, which can be turned into complimenting bud vases after the note is read! Free Printable Count down till summer. Print this and frame it to help those teachers count down to those special events throughout the year. Or maybe a big test that’s coming up. They will love these mini art easels that they can display on their desks. Take note you are one of my very favorite teachers! For this idea, pick up a cute stack of note cards and print out this darling tag! This Mirror Memo Board idea that is a perfect way to dress-up any classroom! Use this how to print on a hat tutorial to make your teacher a hat! A washi tape notebook would make a modern and useful gift! Whip up this delicious granola recipe and add these custom labels and recipe for a yummy gift. Your teacher is sure to love this printable subway art. Teachers plant the sees of knowledge that will grow forever! This gardening gift idea for a teacher comes complete with a chalkboard label. Cut your own labels with a Silhouette or Cricut. Chalkboard labels can also be purchased at a craft store. This tutorial shows you how to make a lovely vase that not only holds flowers but also displays pictures! So pretty! What teacher wouldn’t love this handy way to keep their rubber stamps! Check out this apple mini Oreo pops tutorial for a cute little teacher gift. This how to make a drawstring pouch tutorial will help you make this clever bag compete with your child’s handwriting. Whip up this whoopie pie recipe and place homemade whoopie pies in an upcycled drink mix container with custom labels you can print. You are a cute above! This embellished scissors tutorial will help you create these fun and unique scissors. Attach this clever saying for a gift that is a cut above! Make this delicious bundt cake recipe and add a cute tag. Love these DIY tote bags! No sewing required. Turn a plain brown lunch sack into an apple with this tutorial. Make these Apple Caramel Cupcakes In A Jar and attach printable thank you gift tags. What teacher couldn’t use some extra cash. Use this origami money folding tutorial to create money flowers to make a money tree. Thanks for being a cool teacher! also Thanks for being a sweet teacher! These printable gift card holders are the perfect way to give a gift card! You are tote-lly a terrific teacher! Attach this cute printable gift tag to a great tote for a useful gift! You might even like to make your own tote with this simple tote bag tutorial. I am so fortunate to have you for a teacher! This printable sticker fits right on a Chinese take out container filled with fortune cookies. A teacher like you is a real treasure! Use this printable to cover treasures candies and place in a bag with a printable treat topper. We need s’more teachers like you. Package s’more fixings in a bag and attach this treat bag topper for a yummy gift. This printable candy bar wrapper is the perfect way to gift a Kit Kat bar. Don’t miss theseTeacher Appreciation Ideas (more sayings and packaging ideas)! Here are 10 great ways to thank a teacher, fun candy gram sayings for teacher appreciation and from simple totes to fabric covered notepads to make the Handmade Gift Guide for Teachers has some wonderful ideas. Make it super easy to thank your teacher with these 50 cute teacher appreciation gift tags. Simply pair the gift tag with the suggested gift. They are ready to instantly download, print, cut and attach to your gift! For $3.00 you get 50 fabulous tags (FIVE pages of tags and gift suggestions)! Teachers just love to get gift cards, for just $5! After years of receiving stationary, mugs, flowers, candy, etc. A coffee, Target, A.C. Moore, Office Depot, sandwich shop gift card and a note is just perfect! Thanks so much for featuring my S'mores printable in your post! I am so honored!! Thank you SOOO much for all of this - it's terrific!!! So very useful. I used the "Thank you for helping my child bloom" printables. Love it so much!